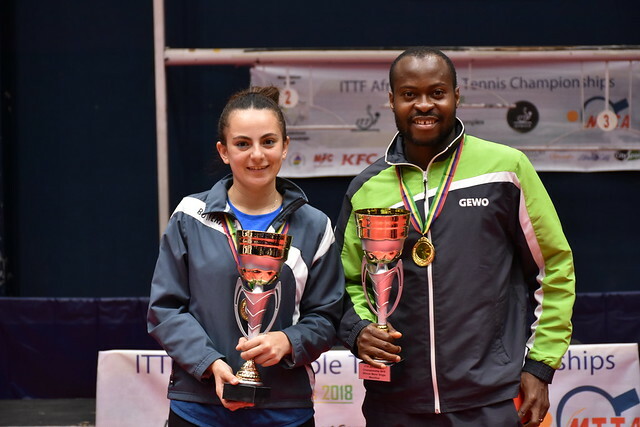 Success earlier in the week, emerging victorious in the Women’s Team event; in the Women’s Doubles competition at the 2018 ITTF-African Championships in Port Louis , Mauritius, Egypt is assured of adding to that success. Following a series of impressive performances on Friday 7th September; Yousra Helmy and Dina Meshref alongside Farah Abdel-Aziz and Reem El-Eraky booked places in the final. However, the partnership to attract the attention was South Africa’s Simeen Mookrey and Danisha Patel. Matters commenced with a relatively comfortable win for the South Africans against the host nation’s Maena André and Priyal Bunwaree (11-4, 11-1, 11-5), followed by a full distance five games win in opposition to Egypt’s Alaa Saad and Amira Yousry (7-11, 11-9, 5-11, 11-8, 11-7). Creditable performances but it was at the quarter-final stage when the pair shone, the stage at which matches became best of seven games, as opposed to best of five games in the early rounds. Contrary to all expectations, they accounted for Nigeria’s Esther Oribamise and Olufunke Oshonaike, the no.3 seeds; most impressively they prevailed in five games (13-11, 11-8, 11-9, 8-11, 11-8). Victory in five games in the round of the last eight pairs; at the semi-final stage it was defeat by the same margin; they were beaten by Yousra Helmy and Dina Meshref, the top seeds (11-7, 11-9, 11-2, 9-11, 12-10). Defeat for Simeen Mookrey and Danisha Patel but a second bronze medal to add to that clinched in the Women’s Team event was not to be predicted; in Port Louis the South African Women’s Team had exceeded expectations. A hard fought success against Simeen Mookrey and Danisha Patel; earlier without a game being conceded, Yousra Helmy and Dina Meshref had beaten the host nation’s Sandhana Desscann and Ruqayyah Kinoo (11-6, 11-7, 11-6), followed by a quarter-final success in opposition to the Republic of Congo’s Ammadine Litobanka and Cyntia Nzangani (11-5, 11-7, 11-4, 11-6). Meanwhile, the opposite half of the draw; Farah Abdel-Aziz and Reem El-Eraky, the no.2 seeds, had also ended Nigerian hopes, their main rivals, in the quarter-finals. After accounting for Christy Bristol and Zahhira Khattabe of the Seychelles (11-2, 11-3, 11-5); they ended the hopes of Offiong Edem and Janet Offiong (11-8, 14-12, 6-11, 11-5, 11-9) to reserve their place in the penultimate round. Good form and the good form continued; the Egyptian duo ousted Algeria’s Lynda Loghraibi and Katia Kessaci, the no.3 seeds (12-10, 11-6, 11-8, 11-8) to reserve their place in the final. The final of the Women’s Doubles event will be played on the evening of Saturday 8th September.